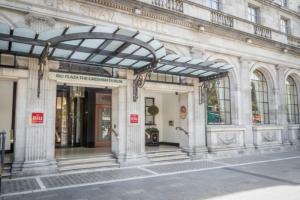 Set in the heart of Dublin, this hotel is just minutes away from Croke Park, the Temple Bar and other popular attractions, as well as great shopping and nightlife. This grand hotel is a landmark building with original period features including stunning Waterford crystal chandeliers. The hotel features 300 elegant guest rooms and suites; the suites include penthouse balconies with stunning views across the city and the Dublin mountains. Located in the heart of Dublin, on O'Connell Street, about 20 minutes from the airport. Grafton Street, Henry Street, 3Arena, Gate Theatre, Savoy Cinema Dublin, Abbey Theatre, Tivoli Theatre, Olympia Theatre, Croke Park.